My 5: Rick’s Cafe, Casablanca. 1. October 2008. I often get asked what my favorite dishes are from around the world. Well, I love Mexican (Chimichanga! ), adore Lebanese (Kafta! ), can’t get enough of an authentic oven-cooked pizza (cheese cheese, cheese!) and there are a whole bunch of Chinese dishes that always get the mouth watering, from a simple stir-fried egg and tomato (fānqié chǎo dàn) and spicy runner beans (Gan Bian Si Ji Dou) to Beijing Duck and pretty much anything from western China’s Muslim-influenced Xinjiang region. But top spot goes to Indian food; I just go literally crazy for a rich curry with pilau rice and garlic naan washed down with an ice-cold Kingfisher. 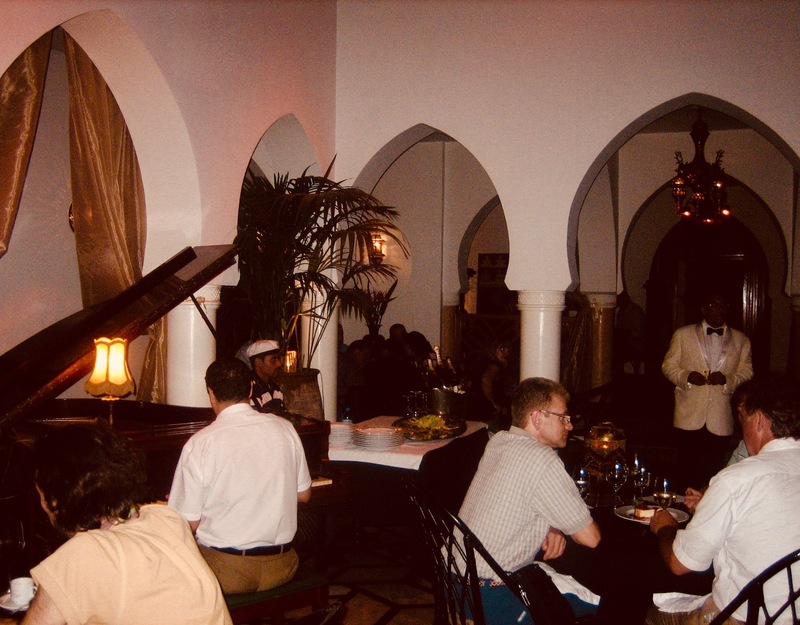 A friend of mine recently asked about my Top 5 restaurant experiences and I found myself suddenly transported back to the Moroccan capital of Casablanca on a perfect evening at Rick’s Café, a loving recreation of the famous bar from the classic movie Casablanca. 2. October 2008. It was October the 15th 2008 and S and I were on our honeymoon. 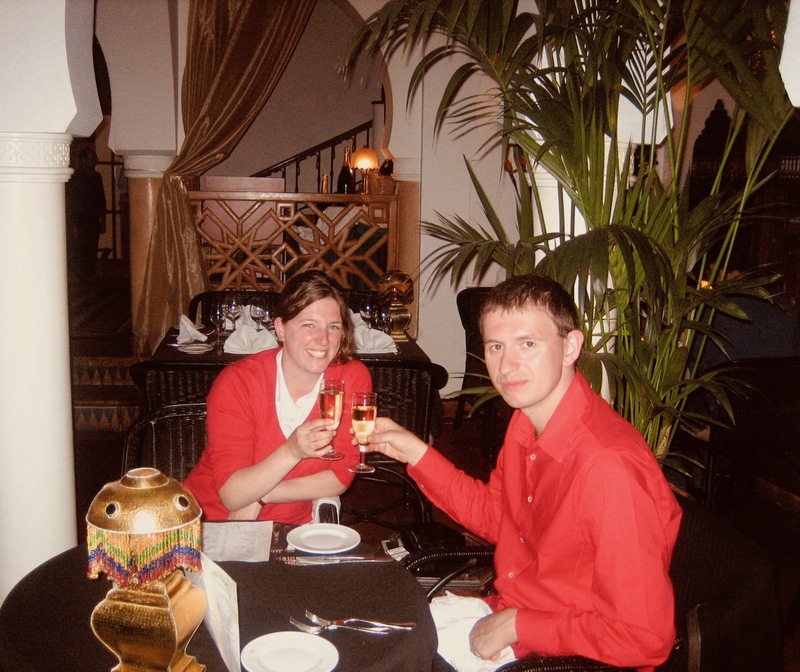 We had a great trip around the country that month and had promised ourselves one grand, all-out dinner where we’d just say to hell with the expense and celebrate in style. As soon as I heard about Rick’s I knew this was the place. I’ve always been a huge fan of the movie and just found Bogart and Bergman’s screen presence absolutely electrifying. Imagine my delight then when I entered Rick’s with its sculpted bar, white arches, towering columns, hovering second floor balconies, stenciled lighting and lush, shadow-casting plants abound. It was, as they, say literally like stepping into a movie. 3. October 2008. 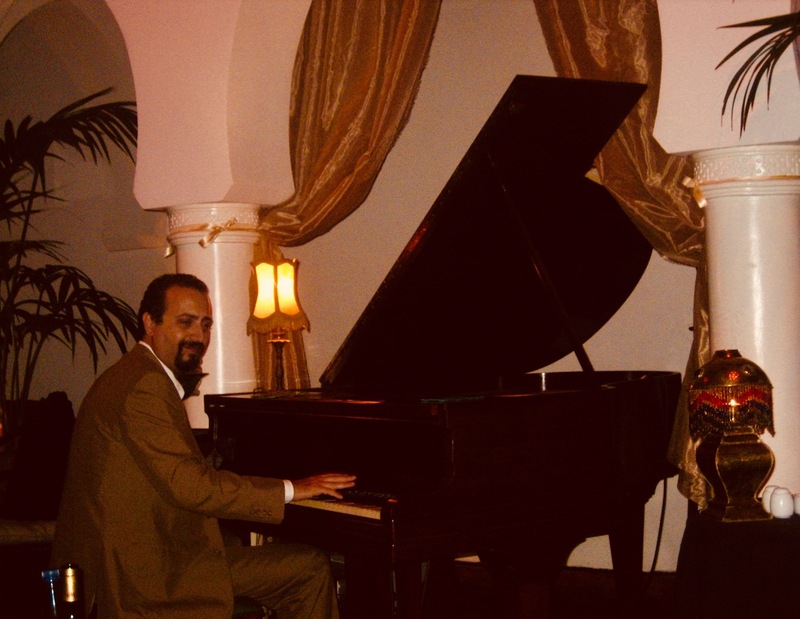 True to the very heartbeat of the movie’s colonial style, Rick’s also features live piano performances from the house player, although this guy’s not called Sam but rather Issam, a man who’s been here since the place opened over fourteen and a half years ago. He was hired by the restaurant’s American owner Kathy Kriger, a former American diplomat who cashed in her pension plan to buy what she described as “a wreck of a building” in the city’s ancient medina. Together Kathy and Issam have worked tirelessly to make Rick’s one of the world’s most unique restaurants. And for those of you wondering, yes he can knock out a perfect rendition of As Time Goes By. 4. October 2008. So what about the food? I hear you ask. Well, that dinner may well be over a decade ago but I can still remember how fantastic it was. I had to check their online menu to remember what I’d gone for: a T-bone steak with caramelized onions, while for dessert we’d shared a taster platter of all their sweet bites. Enter cheesecake, chocolate mousse, vanilla ice cream and more. 5. Rick’s Cafe, October 2008. 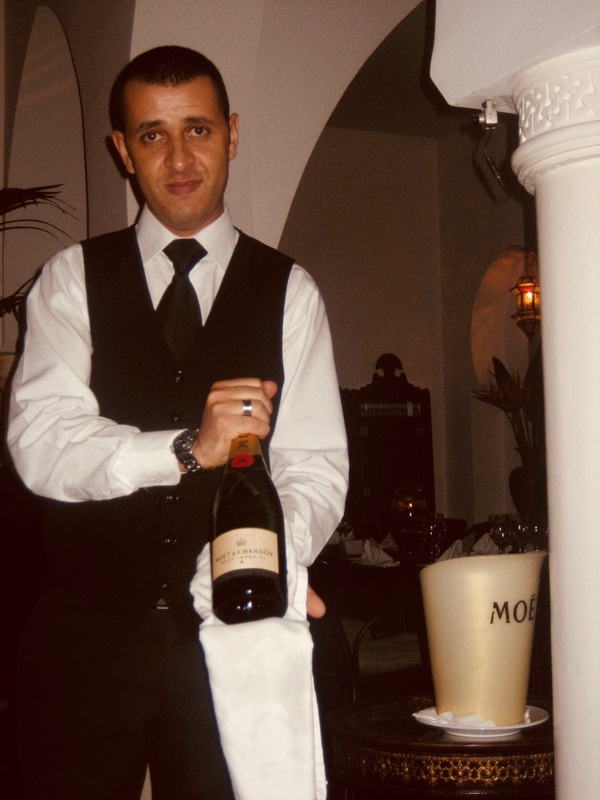 The service was spot on that night too and in the excitement of it all we spontaneously decided to order a bottle of the house champagne while we waited for our deliciousness to arrive. It was very busy that evening, as it is most nights I’m reliably informed, so our decision to reserve a table proved to be a wise one. We could have gone anywhere for our honeymoon dinner, but looking back I can only conclude that of all the gin joints in all the towns in all the world, I’m glad we chose this one! Sorry, it had to be done. You can find Rick’s Café at 248 Boulevard Sour Jdid; it’s open daily from 12:00-15:00 & 18:30-01:00. Like this? Then why not have a look at my other 5s on Casablanca. I’ve also written a bunch of 5s from all around Morocco. I’ve been living, working and traveling all over the world for nearly twenty years, so why not check out my huge library of My 5s from over 30 countries. My 5: Erawan Falls – Kanchanaburi, Thailand. My 5: Café Iruña – Pamplona, Spain.